CHIN WELL Holdings Bhd would probably be one of the few companies that welcome the dreaded Goods and Services Tax (GST) with open arms. Rightly so too, as executive director Tsai Chi Yun tells The Edge that orders for its threaded rods have surged sixfold, from 100 tonnes to 600 tonnes, since the implementation of GST on April 1. With the input tax system in place, industrial users are deterred from sourcing threaded rods from smugglers as they will not be able to claim tax rebates if they do so. Nonetheless, while GST is a boon, a bigger blessing for Chin Well (fundamental: 2.1; valuation: 2) would be a five-year extension of the anti-dumping duties in Europe, which is the biggest market for the Prai-based maker of bolts, nuts and screws. Europe’s five-year regulation against dumping of China’s steel products, which expired in February last year, is currently under review. If the review is in favour of the regulation, Europe may extend it for another five years. Nevertheless, during this period of review, it remains in force. Chin Well is among eight Malaysian producers that have been exempted by the European Union from the anti-circumvention duty imposed on Malaysia for the sale of certain steel fasteners. European customers who purchase from companies not exempted from the anti-circumvention duty will be subject to a tariff of 76% on the product value. For its financial year ended June 30, 2014, Europe contributed 58% to Chin Well’s revenue, while Malaysia, its second largest market, contributed 24%. If the anti-dumping regulation is lifted, Chin Well could be negatively impacted. This is because its European customers could ask for a reduction in prices, to at least the same level as the cheaper Chinese imports. According to Tsai, the price difference between the Chinese products and that of Chin Well has narrowed to 12% now, from 20% in 2009. Over the past few years, Chinese manufacturers have also seen an increase in costs, having to adopt wastewater treatment systems for their factories, as opposed to having none previously. Tsai seems convinced that the anti-dumping regulation will continue for another five years. The decision will be known by the end of the month. “We really hope that the anti-dumping regulation will be extended for another five years. By then, I don’t think there will be a problem competing with them (Chinese producers),” she says. Despite the lacklustre economic environment in Europe, Chin Well has not felt the impact. “We see that no matter how good or bad the economy is, there is still a basic need for steel, fasteners included,” explains Tsai. Chin Well has been a benefactor of Europe’s regulation against dumping by Chinese producers. 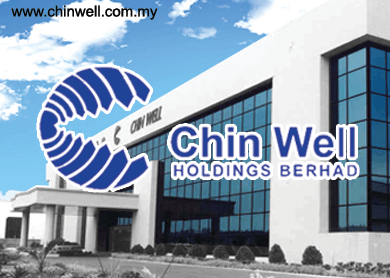 Since 2009, when the regulation was imposed, Chin Well’s sales to Europe grew from RM134.33 million in FY2010 (33% of total revenue) to RM280.49 million in FY2014 (58% of total revenue). At present, most of its sales there are done with Germany and Eastern European nations like Poland and Lithuania. While selling only to industrial users previously, Chin Well also started selling to do-it-yourself (DIY) retailers in 2010, as the latter sought alternative suppliers outside China due to the anti-dumping regulation. The new business from DIY retailers prompted Chin Well to set up two new factories in Vietnam focusing on making products for the DIY market. Tsai says sales of such products have grown continuously since the factories started operations in 2010. According to her, the margins for the DIY products are high — 20% to 25%. Thanks to the DIY segment, Chin Well’s profit margins have improved over the last three years. In FY2010, net margin was 3.5% but by end-FY2014, it almost doubled to 6.8%. Currently, Chin Well ships about 4,000 tonnes of fasteners per month out of its Vietnam factories. It has contracts to supply to five DIY retailers in Europe and is in talks with two more retailers. Tsai says it is not an easy market to enter into as it requires up to a year before a contract can be secured with a retailer. However, after the contract is signed, it is usually “stable” for the next three to five years. Moving forward, Chin Well is expecting revenue to grow between 5% and 8% annually. However, Tsai says it would depend on Europe extending the anti-dumping regulation. “Of course, we want to have much better growth, but it really depends on how fast we get more DIY retailers and the market situation in Europe,” she adds. 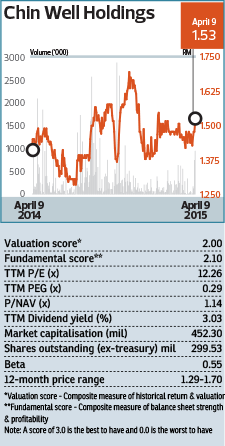 Over the last year, Chin Well’s shares have been trading between RM1.69 and RM1.29. The stock hit a 52-week high of RM1.69 on Nov 13 last year, but has slid since. Last Thursday, it closed at RM1.54, giving the company a market capitalisation of RM452.3 million.